Sri Sri Ravi Shankar had said in Delhi earlier this week that he is involved in the dispute as a mediator of his own will and would visit Ayodhya on November 16 to meet all stakeholders. The meeting between Sri Sri Ravi Shankar and Yogi Adityanath was a courtesy call, said UP government. Lucknow: In a matter of weeks, the Supreme Court will start what it has described as "final hearings" over the disputed Ayodhya site that is claimed by both Hindus and Muslims. Let the court first come to a conclusion, cautioned the ruling BJP, as spiritual leader Sri Sri Ravi Shankar heads to the religious town tomorrow. Sri Sri, 61, says he is mediating talks between Hindu and Muslim groups of his own accord and will listen to everybody. 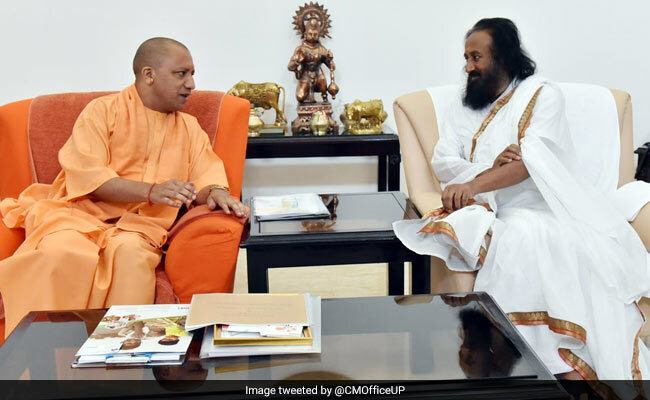 Sri Sri, who heads the Art of Living Foundation, met today with Uttar Pradesh Chief Minister Yogi Adityanath. His aides described the 20-minute meeting as a "courtesy call." A senior government official told the Press Trust of India, "As far as the Ayodhya issue is concerned, Yogi Adityanath's stand is very clear. The state government is not a party. We welcome any settlement and will honour the decision of the court." "The Ram Temple matter is in the Supreme Court and I think we should let the legal process be complete. Other discussions can be held after that," senior BJP leader Ram Madhav has said on Sri Sri Ravi Shankar's Ayodhya plan. On December 6, 1992, thousands of right-wing activists razed the 16th-century Babri Mosque in Ayodhya, claiming it was built on a temple marking the birthplace of Lord Ram which was destroyed in the 16th century. The country's worst riots followed the Babri Masjid demolition; 2,000 people were killed. In 2010, the Lucknow High Court said the site should be shared between Hindus and Muslims. The verdict allotted two-thirds of the land to Hindus and said they could keep a makeshift temple that was built over the razed mosque's central dome. Both Hindu and Muslim organizations involved in the dispute rejected the order and appealed against it to the Supreme Court, which, in March this year, suggested an out-of-court settlement was the preferred solution. Muslims make up about 13 per cent of India's population. Most of them are Sunni; properties owned by the community are handled by the Sunni Waqf Board which was given a third of the land in the 2010 verdict. The Shia Waqf Board, on the other hand, said earlier this year that a mosque could be built at a small distance from the disputed site. "If the Ram temple and mosque co-exist it will lead to conflicts," the Shia body said, provoking fierce criticism from its Sunni counterpart, which says it alone is a party to the dispute with Hindu organizations. The Shia Board's stand has been embraced by Akhil Bharatiya Akhada Parishad, an umbrella organisation of Hindu sadhus, which said on Monday the issue is resolved and no mediation is needed. "Those in favour of temple construction and the Shia Waqf Board have completely agreed on this. We have discussed it with almost all the parties in the case," the organization's chief, Narendra Giri, said. Religious and personal law matters of Muslims -marriage, for example - are decided by the All India Muslim Personal Law Board. It has objected to not being consulted by Sri Sri, who has met with the Shia Waqf Board's representatives. "About 12 years ago, Sri Sri had made a similar move and had concluded that the disputed site be handed over to Hindus...what new formula he has found this time should be disclosed," said the organization's general secretary, Maulana Wali Rehmani. Its campaign for a Ram temple in Ayodhya propelled the BJP into a major political force in the 1990s, but in the last few years the party relegated it to the back pages of its election manifestos even in Uttar Pradesh. Chief Minister Yogi Adityanath, a saffron-clad priest who took charge after the BJP's sweep n assembly elections this year, has asserted that building a Ram temple is a key agenda. The Chief Minister began his campaign for crucial local body elections in the state from Ayodhya yesterday. He said "Ayodhya" means a place where there is no possibility of a "yudh" (fight).